Our gathering here marks the conclusion of my visit to Guernsey. It is a pleasure for me to attend this lunch, because it offers me an opportunity to once again join Chief Minister Harwood and other ministers of the Policy Council. Last October in London Chief Minister Harwood invited me to visit Guernsey. I gladly accepted the invitation. My decision to come has been proved a wise one. Within over two days I have accomplished a visit of discovery, cooperation and friendship. Let me explain to you my impressions of these three gains. · Guernsey is the world’s second largest off-shore financial centre. · Guernsey is Europe’s largest centre of captive insurance. · Guernsey has developed advanced animal husbandry and crop farming. All these achievements have left me with a deep impression. At the same time, I am greatly attracted to Guernsey’s natural beauty combined with a strong historical and cultural heritage. Now I feel strongly that China-Guernsey cooperation in financial sector and breeding industry already have an excellent foundation. Our two sides should seize opportunities and identify new areas. There’s clear potential to widen our exchanges in culture, education, tourism and other realms. And we should take bigger and bolder steps. 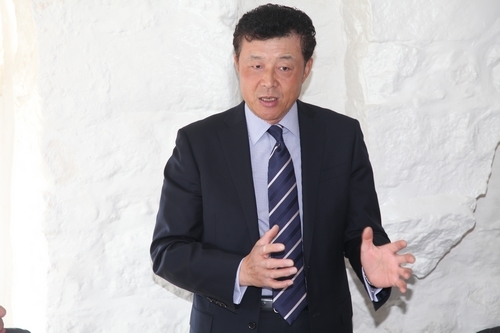 Together we should encourage more Chinese enterprises to explore Guernsey and start business on your wonderful island. In turn, my country will welcome more Guernsey companies to seize growth opportunities in China. Throughout this visit, wherever I went, I felt the Guernsey government and people’s strong interest in China. I experienced and saw their aspiration for cooperation with China. I was delighted to see in a Guernsey gallery an exhibition by Chinese artists. This shows that strengthening exchanges and cooperation in art, culture and creative industries will have a positive and far-reaching influence on our overall relations. China will fully support links in these fields. I want to once again thank Chief Minister Harwood, and all of you, for the thoughtful arrangements. I welcome you to visit China!